This is the highest quality treadmill mat we could find, and also the only one that is properly sized for an office walking treadmill. Other, cheaper mats exist, but are too large, too thin and flimsy, and won't provide the same level of floor and treadmill protection, or reduce noise, vibration and dirt nearly as well. This mat is the best ecological choice as well, made entirely out of recycled tire rubber, in the USA. Way nicer than PVC mats made in China that can outgas and leave a nasty odor in your office. Five-year, full-performance warranty is the best in the industry. The ideal footprint for office treadmills, this mat won't uglify your office, run into the legs of your treadmill desk, or become a trip hazard. Premium 1/4" thickness means it will provide better floor protection, anti-static benefit, noise isolation, and shock absorption. Made in the USA out of 100% recycled rubber, better for the environment. A little pricier than mats designed for gym equipment, but you get a lot more for your money in the end. A good under-treadmill mat will pay dividends by reducing noise, vibration and dust collection in the innards of your treadmill, while protecting the floors from damage. However, beware that most mats are too thin, and they're made for much larger gym equipment as compared to minimal-footprint office treadmills. This premium mat is made of the best and thickest material - 100% recycled rubber - and as the name implies, is just the right size. That's important, because an overly large equipment mat (virtually all the others on the market) will look your office look more like a gym, and worse, can pose interference problems with the legs of your treadmill desk, or present a tripping hazard. The iMovR RightSize Premium Under-Treadmill Mat is a no-compromise solution designed specifically for office treadmill desk workstations. The product is made in the USA and comes with a five year full performance warranty, longer than any other treadmill mat offers. Most mats are designed for larger gym equipment like running treadmills (very long) or elliptical machines (very wide), so their dimensions tend to be overly large for an office treadmill workstation. Besides looking ugly on your office floor, they create a trip hazard, and can run into the legs of your height-adjustable desk – making it impossible to center your treadmill on the mat, or forcing you to put one leg on the mat and the other on the floor, tilting your entire desk. The RightSize Mat, as the name implies, is custom-cut to 32″x72″ to ideally tuck under all popular models of office walking treadmills without any of these issues. Most mats are just far too thin, sold as disposable items to people buying gym equipment for their home, that everyone knows will just end up in the garage or attic after a couple of months. Mats that are only 2 mm or 4 mm thick (e.g. the LifeSpan Treadmill Mat and Nike Grind Equipment Mat, respectively) are not going to provide as much shock absorption and won’t be as durable as higher-quality mats like the RightSize. Good mats are 6 mm thick (1/4″), like this one. Anything thinner will provide minimal protection from noise, vibration and damage to the floor. Thinner mats have a tendency to curl at the edges over time – causing an even greater trip hazard – or leave deep impressions from the feet of the treadmill. If a mat is thick but made of cheap, low-density material it will offer the treadmill a too-soft surface, which can impose torsional stresses on the treadmill frame and lead to a host of mechanical problems and shortened equipment life. For these reasons skimping on the quality of the mat under your treadmill is, in our opinion, absolutely the wrong place to save $10 or $20. Beware of mats made of PVC (vinyl), these are the cheapest but they’re not made to last, and their manufacturing process is much more harmful to the environment. For this reason most PVC mats are made in China, where the EPA isn’t around to enforce environmental laws. A good treadmill mat will be made of 100% rubber. A better mat will be made of recycled rubber (typically from tires). The best mats, like the RightSize, are also made in America. That goes for quality as well as environmental sensibility. If you read the user reviews on cheap treadmill mats offered on Amazon you’ll also frequently read about unpleasant outgassing odors that no one needs in their office. Treadmill mats get dirty. But some mats can be ridiculously hard to clean from dust and footprints, again not something you’d want to have to hassle with in your office. You want a nice, firm mat that can be easily cleaned without special chemicals, just soap and water. Better yet, getting a mat that is perfectly sized to your treadmill will keep all but a tiny surface area from being exposed, so you don’t have to hassle with keeping the mat looking nice. At the end of the day, even though a mat made in the USA from 100% recycled rubber will cost more, it should last forever, saving money, time, hassle, landfill space, and a whole lot of pollution. 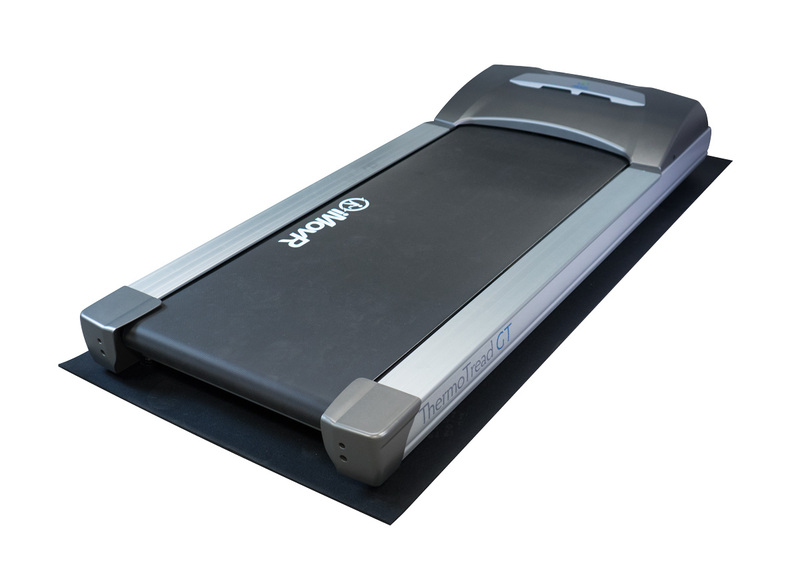 At 32″ x 72″ in footprint, the RightSize Under-Treadmill Mat is ideally sized for all popular office treadmills including the iMovR ThermoTread GT, Lifespan Fitness TR800/TR1200/TR5000, Rebel Desk 1000, TreadDesk, and Steelcase Walkstation. Ironically, you would think that a really tough product like a rubber treadmill mat would come with a long warranty. The fact that the vast majority of inexpensive treadmill mats on the market don’t offer any warranty at all is very telling! Rarely, you’ll see a three year warranty. The iMovR RightSize Treadmill Mat was designed to last, and features an industry-leading FIVE YEAR full-performance warranty. Meaning it is warrantied not only against manufacturing defects but also against edge curling or any other degradation in performance. If ordered on its own the iMovR RightSize Rubber Treadmill Mat is shipped by FedEx Ground. Free shipping is included in the price. If ordered together with an iMovR treadmill the product is shipped on the same pallet, also with no extra shipping fee. The mat is 32″ x 72″ x 1/4″, and weighs 20 lbs. See our comprehensive Treadmill Mat Comparison Review to learn more about the best treadmill mat for your walking workstation setup. *Full disclosure: iMovR and WorkWhileWalking have mutual ownership interest. However, we can assure our readers that we expose the good and the bad of every product, regardless of any financial connection we may have to the manufacturer.